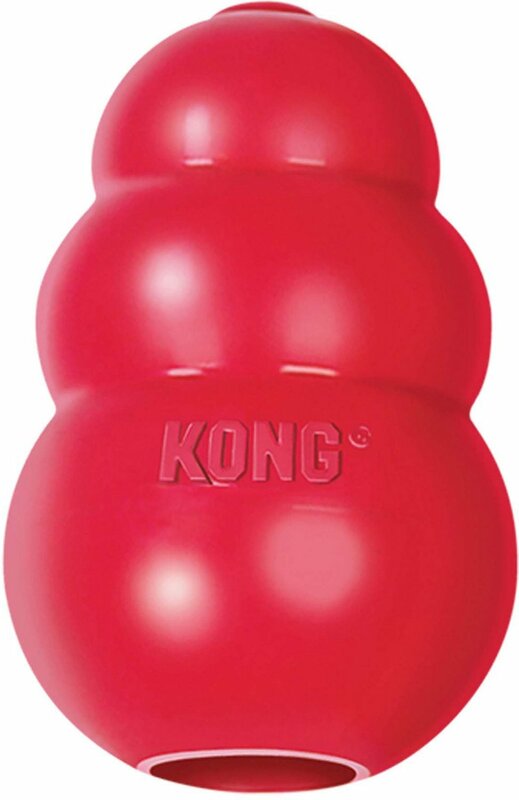 Give your furry friend a reliable and fun plaything with the KONG Classic Dog Toy. 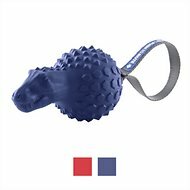 Made from all-natural red rubber, this toy is extremely durable and features an erratic bounce your pup will love. Pet parents can even fill it with kibble, treats or peanut butter to add more excitement to playtime. 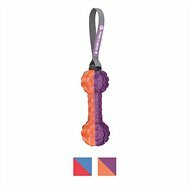 Whether your paw-tner loves a game of fetch or simply wants something to chew on, KONG Classic Dog Toy will fulfill all of his needs and more. Classic KONG toy that pets know and love. Made with a durable, all-natural red rubber formula. Every dog plays differently and, since not all toys are created equal, it’s always best to keep a close watch on your pup in case things get ruff. Supervised play will help toys last longer and most importantly keep your pal safe. No dog toy is truly indestructible, so always remove the toy from playtime if pieces begin to break off. Power chewers: Increase one or two sizes or try KONG Extreme. 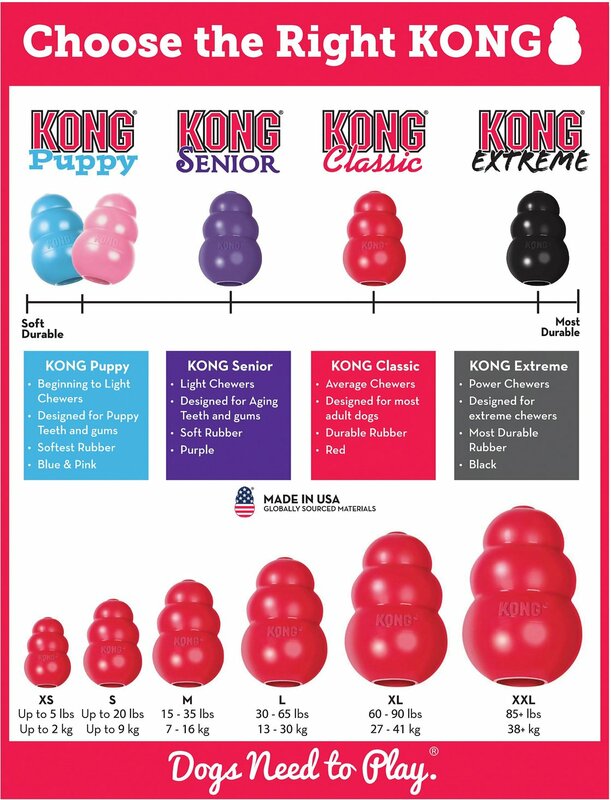 KONG toys have been enriching dogs for over 40-years, strengthening the bond between dog and pet parent along the way. 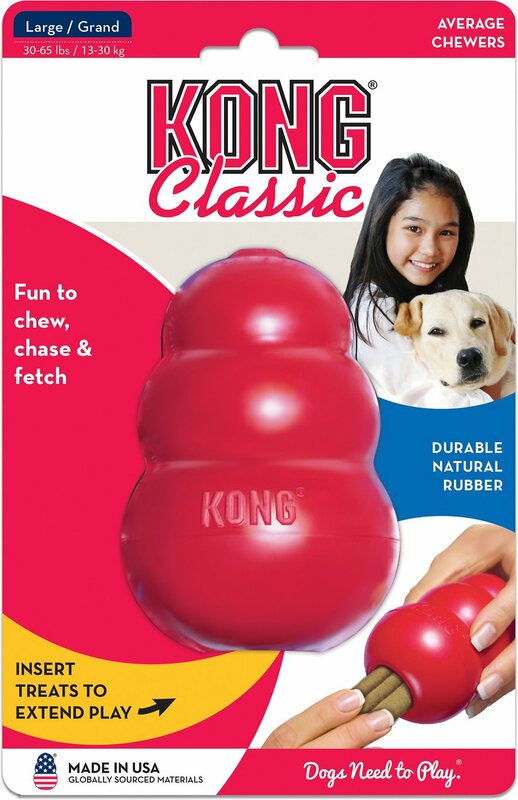 The KONG Classic uses the KONG All-Natural rubber formula and is ideal for average chewing dogs. 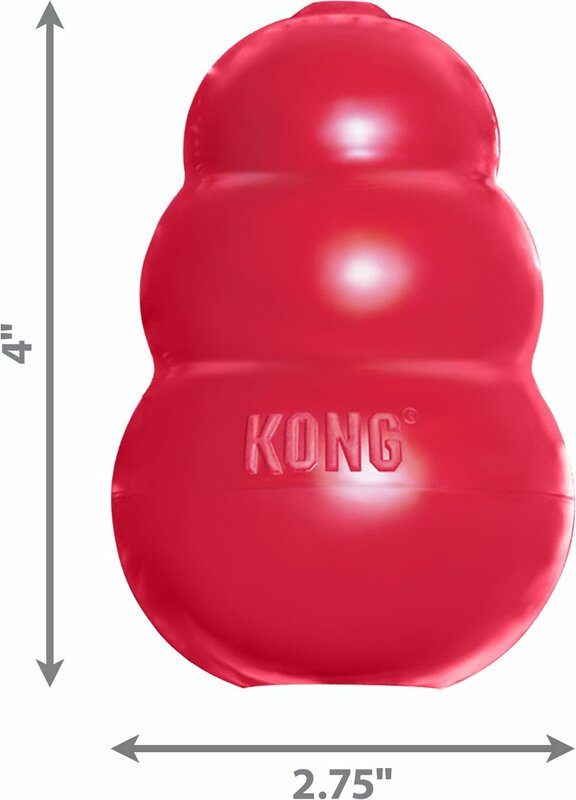 Kong toys are great for keeping your dog entertained! I do HIGHLY recommend checking the size of this product at your local store first, to make sure you purchase the right size for your dog. Do not be fooled by their "sizing guide"- I have a German Shepherd and the "Classic" was recommended as the right size. Unfortunately when I received the product and the opening is WAY too small for the dog. Ended up having to scrape out the peanut butter out of the middle because there was no way he could get into it. Actually ended up comparing sizes in the store and realizing the XXL was a better size. I will be ordering that one. I normally love KONG toys and have several that have survived my power chewer Australian Shepherd (large version of this). I purchased this one (puppy size) for my corgi puppy and it was much smaller than I had expected. It also did not hold up as well as other kong toys and he managed to chew off the tip of it within the first 48 hours. I wouldn't recommend this one to any size dog. The larger ones seem to hold up better and would be a better alternative to the smaller options. Be sure to check measurements before purchasing! A friend sent me the link to this website and said this particular toy kept his JR amused for hours.. So I decided to get one and when it arrived I just started laughing. 15 bucks for a tiny little rubber thing. My small JR couldn't even get his tongue in to get the peanut butter out.. Waste of money if you don't know what size you're getting. Sisco loves it, just too small for him. I was hoping to find a durable toy that my Aussie could lick peanut butter out of to keep her entertained. I bought the large, but the hole is too small to allow her tongue in there well enough. I live on a farm, and unfortunately the Kong with peanut butter in it attracts ants inside. Maybe I need to try a much larger size? I could not find size information on the website to address my concern (hole size). The large would work well for a smaller dog who needs something to lick out. What's not to like about a kong...you can put treats inside to challenge them and it's something they can chew on and not get in trouble!...plus if your dog is a ball chaser, the unpredictability of the bounce when thrown is especially fun for them. 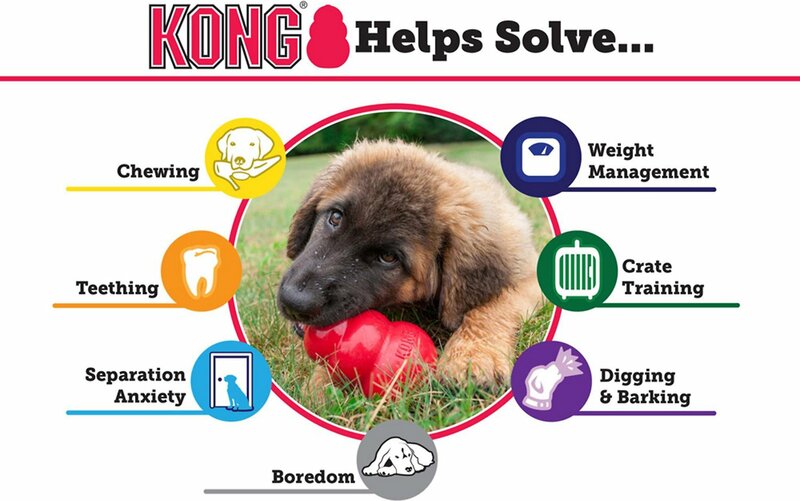 I have used Kong products since the early 1980s (we are both Colorado natives). I bought my first classic Kong toy 15 years ago for my stepson's 125# PitBull mix who had never before found a toy he couldn't destroy. It worked great! When I got my own 1 year Pitbull, I knew I needed another for him! He is an extreme chewer and both toy and food motivated. He loves this toy! He chews, chases and just carries it around. I tried putting dog treats inside, but that got him way too excited and protective of his toy. So now, he plays with it for hours each day. It is also the toy that goes in his crate when he does. I am thinking of getting a second one as a spare in case he 'loses' this one!